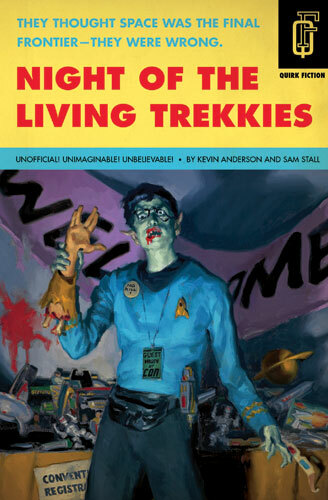 A surprisingly awesome book in which a Star Trek convention in a Houston hotel is overrun by zombies, and we follow unwilling hotel staffer Jim Pike as he tries to rescue his sister. This is a book for Trekkies more than anyone, and is filled with more Star Trek references than an official Trek reference book. There are also tips of the hat to a variety of other science fiction franchises, which makes this more rounded than just a fanboyish novel might sound. Even the things that seem not to be Trek related are, such as a lot of the characters' names. I'm not usually a reader of horror novels - I bought this based on the title alone - but to me it stood up as a story with a lot more depth than I was expecting. The characters are rounded and believable, and the action is entirely plausible. We're aligned with one character pretty much throughout as the plot flows naturally and at a perfect speed. I wasn't expecting anything this good when I picked this book up and am very pleased I've read it - it was hard to put down and is probably one of the most fun books I've read for some time. Absolutely fantastic - I hope the authors have more to come.